'Bambella: Wake up kids, we've got the dreamers disease. Wake up kids, we've got the dreamers disease. If you follow me on Instagram (@alexmaceachern) you'll be fully aware that I'm in love with nail art. Sometimes people ask me why I spend so much time doing my make up, and I simply reply with 'becasue it's like art, but for your face'. It's a little painting you can do everyday, if you think about it, a lot of make up is similar to painting (eye liner, lipstick, foundation, etc.). I think this exact same thing for nail art, it's 10 (or however many fingers you were blessed with) miniature paintings, that just happen to be on the end of your fingers! I've done many previous nail decorations in the past and just wanted to share a few, as well as include today's nails. Sorry for the bad quality images, they were all from Instagram. If you have any questions or would like a 'how to' post on any particular ones, please let me know in the comments! The nail varnish I'm wearing today were kindly gifted to me as a birthday present from Lily over at Red Brick Lipstick. They're both from Models Own and I totally LOVE them. The Lilac Dream goes on quite thin at first which made me think I may need a few layers, but after about 20 seconds, it seemed to magically thicken up giving perfect coverage from just one layer! 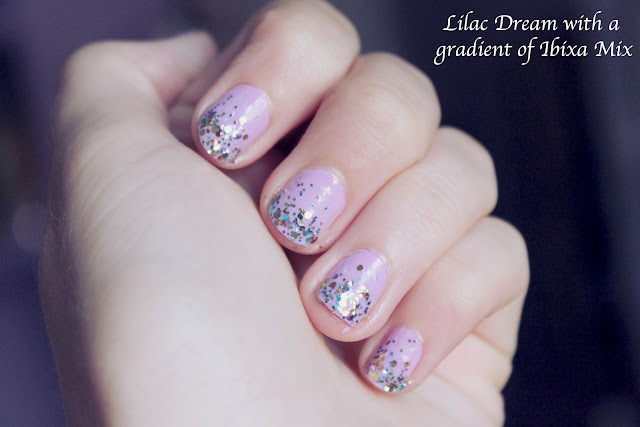 Just ONE layer of Lilac Dream! I then went on to add the gorgeous Ibiza Mix. I love absolutely anything glittery. Anything. So when Lily bought me this I got so excited and just stared at it for a little while after! I decided to have a little change from covering my nails all over in the glitter as I usually do, and chose to do a gradient. Starting thicker at the top and slowly working my way down adding little bits of glitter here and there, I ended up with the look below. I totally love these nails (if I do say so myself!) and plan on doing different colour and glitter variations. I highly recommend the Models Own nail varnishes, they are slightly pricier than the average polish, but considering the cheaper ones you may have to do 2 or 3 coats, where as these take just one, I think it's just as good for the money. The cow nails are so cute! The cows and the flowers and my favourites :) I have both those Models Own polishes, so I might have to try this out tonight! Your nail art is so good! 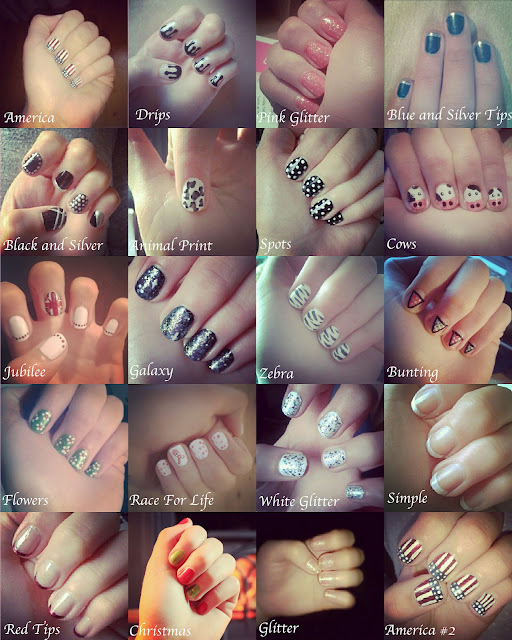 I adore nail art as well, I could spend hours on a design. 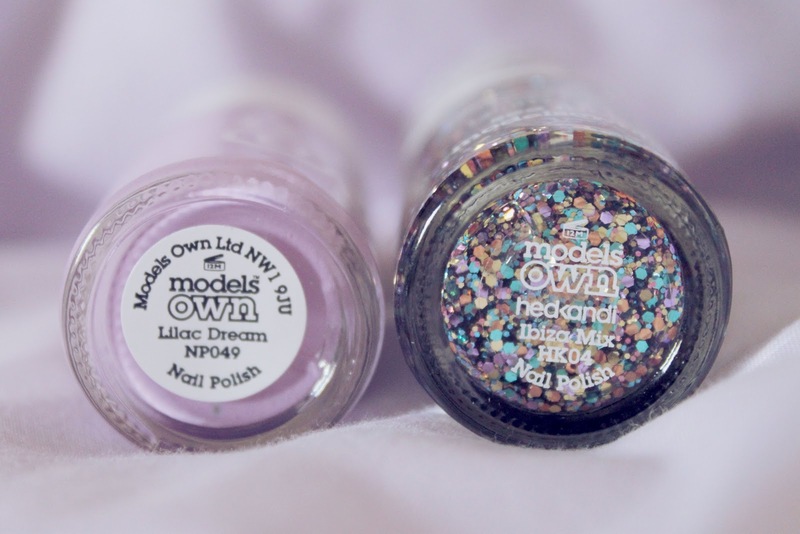 Models Own polishes are my faves, I own about 30 (oh deaaaar). Just discovered your blog, I absolutely adore it already! Your pictures are gorgeous. Aww your nail art is so lovely, i wish i was more adventurous with my nails haha :) I have Ibiza Mix too but i havent ha the opportunity to use it yet, but think i may have to re-create your nail look here, very cute!